The most striking characteristic of the Country Cottage Roof is the rolled eaves and rolled gables. An essential component in these geometrically complex, wavy and undulating roof lines are the curved Cedar shingles, which set apart any roof from the ordinary. If your home is traditionally framed, these rolled edges can be achieved, beginning with our custom facia boards with attached, radiused blocking. 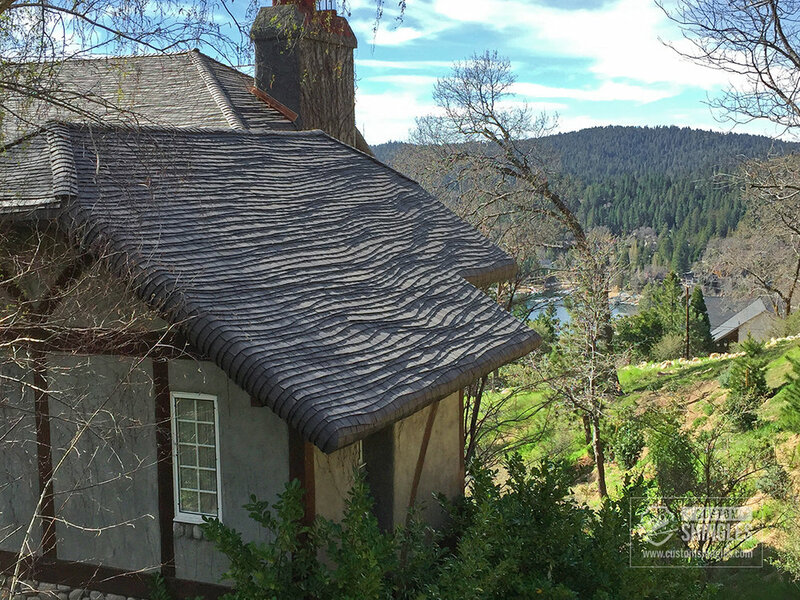 These roofs replace the english thatch-style roofs with smooth sawn shingles, bent to form the gentle rolling curves. Contact us for details or with questions. Can I Afford A Cottage? A cottage roof is more affordable than you may think. The roof system pricing depends mostly upon quantity, complexity (how many roof planes, dormers, etc) and wave coursing (exposure). Pricing generally costs six times that of an asphalt roof, and in many cases, cheaper than slate or high-end clay tile. With the investment of the cottage roof system, you can significantly improve the value of your home, and set it apart from the rest. Contact us for a free estimate.